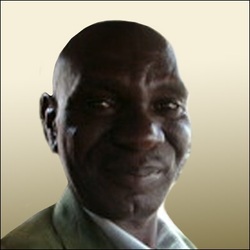 Grand Maghandlela was born in 1960 on a mission station in Kwa Zulu Natal, South Africa. In 1968 went to live with his Grandmother who worked as a domestic worker in a house in Berea, Durban. He went to school in a township nearby but when he came home he would sit outside her room with a stick in his hand drawing in the soft sand. His Grandmother was so impressed that on her Thursday afternoon off she went into Durban shopping centre and bought him a notepad and crayons. This was the start of Grand's art education. In 1984 Grand went to live in Attridgeville, Pretoria with his two brothers and enrolled in PANDA. 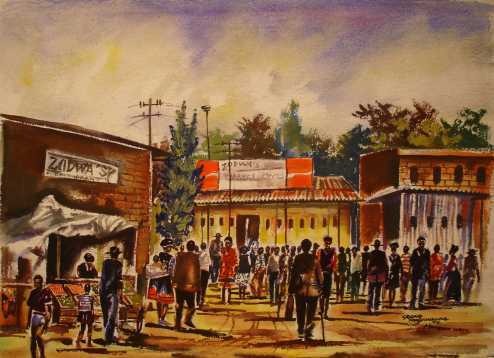 In 1989 Mrs Sher discovered him painting outside the Pretoria Zoo. 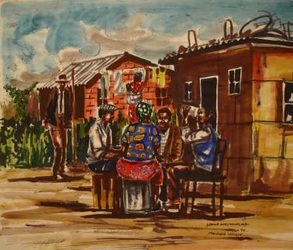 She loved his work and subsequently framed 6 of his township scenes and put them on an exhibition at the Sandton Sun. All 6 were sold. 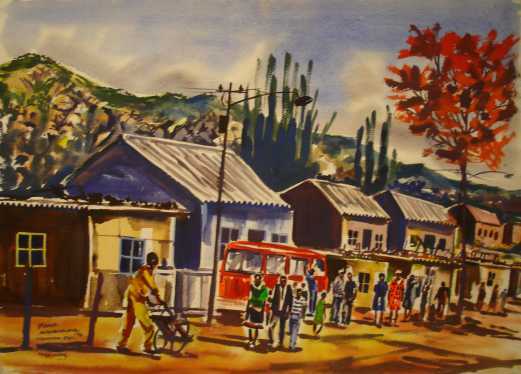 Grand wanted to improve on his artwork so Mrs Sher wrote a letter to the Chairman's Trust Fund at Anglo-American and asked if he could be sponsored to further his studies. She also enclosed a small painting to show his talent to them. After their meeting he was telephoned and offered a sponsorship at the Johannesburg Art Foundation. He studied there for 3 years. The medium he uses is watercolor on paper or acrylic paint on canvas. Subject matter is township scenes and abstract work.